This has been quite a year for Highland born songsmith Rachel Sermanni. 2012 has seen her steadily build as an important new talent from the folk side of things. Debut album Under Mountains will surely go a long way to cementing her place in the folk market and beyond. ‘Ever Since The Chocolate’ is a masterfully woven song that showcases Sermanni’s eccentric lyrics: “I had a chocolate bar, the finest you could find/ It swallowed up my mind and I was free to find you/ Keepers beckoned from their doors/ Syrup glass, marshmallow floors but I slipped through the alleys/ Wanting something more.” Oddly, it’s reminiscent of more delicate offerings from Kate Bush, not only in lyrical content, but its thoughtful and varied production, which is of the highest quality. ‘Marshmallow Unicorn’ is a standout track. With her vocals somewhat grounded, she guides us through the solid composition of an utterly enchanting and delightfully playful ‘album track.’ The presence of a song that will reward listeners who decide to take in Under Mountains in its entirety is most welcome in an age of instant hits.Of course, the usual goes – fans of Laura Marling and Ron Sexmith, with whom she has toured, look no further. However, any established name would be hard pressed to deliver an album of such self-assured resplendence. Ignore the fact that she may be placed in the same pile as Mumford and Sons, the bland nu-folk outfit who seem to have spread through credible pop like a venereal disease. 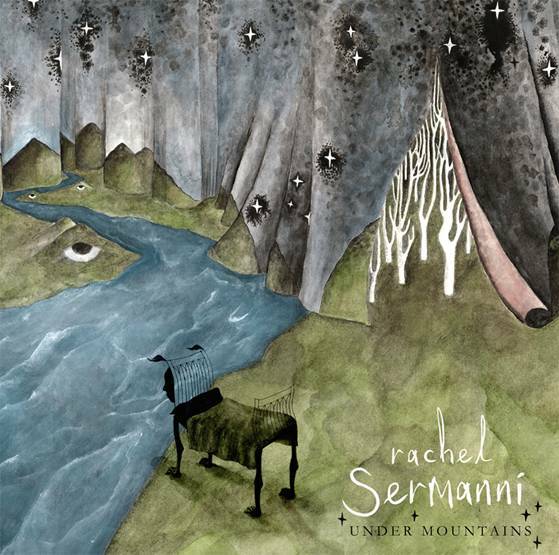 Rachel Sermanni is an astonishing Next Big Thing in her own right. Under Mountains is immensely pleasing not only for its beauty, but for the fact that this is music that could captivate the masses and become a runaway success. I fear that the world of television commercials and supermarket airplay may beckon for some of the songs, but since they are of such quality, who cares? She tours as I write, playing the Arches in Glasgow on October 12th. I for one am highly intrigued to see how Under Mountains will be transformed for the stage. Give it a spin and hear for yourself.